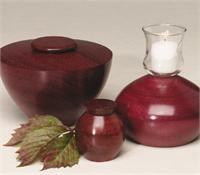 Handcrafted rings of imported purpleheart* are joined together to create this breathtaking urn. Available in two sizes, Regular and keepsake, the regular is offered here. A matching votive candle accessory piece, shown, is also available seperately.Votive does not hold ashes. Please contact us for price. *Due to the nature of wood, color and woodgrains will vary Closure: Top-opening lid that seals with adhesive (not included) 6.5" Dia. x 5"H 50 cu. in. Urn Weight: 3 lbs.